If you are using IDE, then you have to set the Module compilation target either in the IDE or in the tsconfig.json file. Use of the above targets depend on the application and module loader you are using. For example, use CommonJS target option for server side Node.js applications where you are using CommonJS module loader; use AMD target option if you are using client side module loader require.js for the web application; use UMD target option for both client side and server side modules; use System for ES modules, use ES6 or ES2015 for ES5 modules or lower. Now, compile the module EmployeeProcessor (created in the previous chapter), in which we used the Employee module. If you are using Visual Studio 2017, then you can set the module system option in the TypeScript Build tab. Open the project property by right clicking on the project in the solution explorer and select Properties. 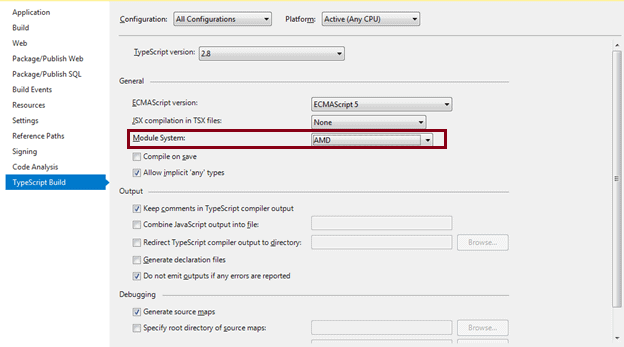 Go to the TypeScriptBuild tab in the property window and set the Module System to AMD, as shown below. The following HTML file shows how to use a module with the require.js module loader in the browser. In the above html code, we included the require.min.js file from CDN using the <script> tag. The <script> tag must also specify the initial module to be loaded for your application using the data-main attribute. Thus, require.js API will load the initial module specified in the data-main attribute and all other modules will be loaded asynchronously as and when required. This way you can export, import, compile and use modules in web application.